Photo taken early in the morning at Bosque del Apache National Wildlife Refuge in New Mexico, December, 2016. During mating, sandhill cranes perform dancing displays. Although the dancing is most common in the breeding season, the cranes can dance all year long. Sometimes the dance involves wing flapping, bowing, jumps and simply playing around. Dancing contributes to pair bonding and allows rivals to assess one another prior to courtship. Parents teach young chicks, also known as colts, to dance. Juvenile cranes practice dancing for years before they select a mate. Cranes also dance when they are excited, frustrated, or just need to release pent-up energy. 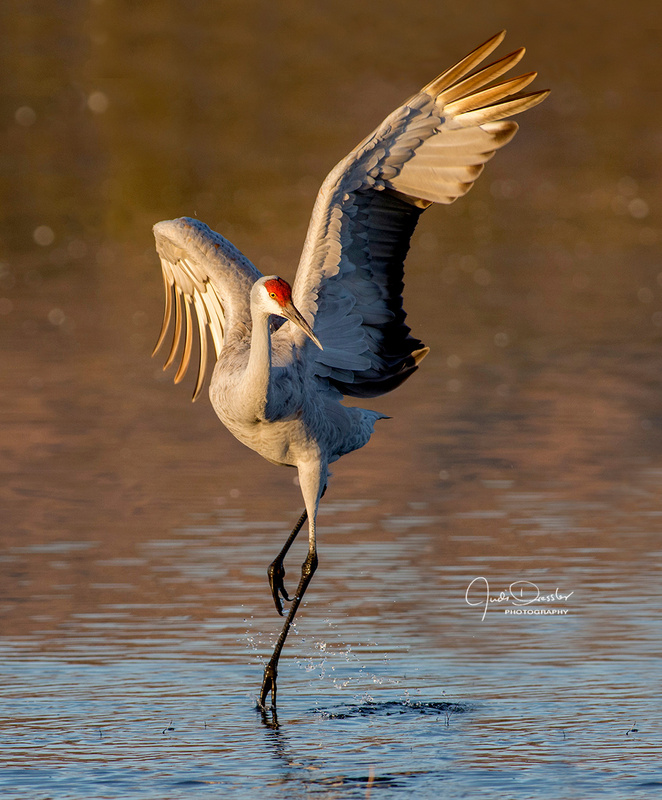 Cranes are considered the most accomplished dancers in the animal kingdom (other than people!). The Rocky Mountain population of greater sandhill cranes is the most abundant subspecies that winters in the Bosque del Apache. They are the largest of all the sandhills, standing four feet tall with a wing span greater than six feet.